By now you have probably heard a little about the Cryoskin 2.0, but still wondering exactly WHAT it is and how it works. 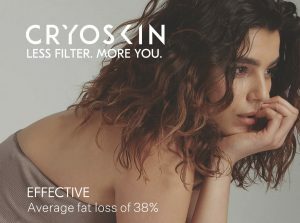 How does the Cryoskin 2.0 work? Cryoskin is a new fat loss device from Paris, France with proven results from thousands of procedures. People may lose from 0.5 to 1.5 inches in 1 treatment. <—YES. That’s NOT a typo. We measure your body before we get started and after we finish, all in less than a one hour period. Let’s go a little further and explain how that works. When you put water in the freezer you know when it comes out as ice – it’s bigger? This is because water expands when it’s cooled. You might be thinking “but I don’t want to EXAPND!” YES. You do. Fat cells happen to be more sensitive to changes in temperature than other cells in your body so, when you cool them, the water in them expands, breaking the cell. These cells then pass out of the lymphatic system and out of your body. Bye-Bye fat cells. How long will the Cryoskin 2.0 results last? The best results occur around 5 sessions – with an average fat loss of 38% from a sample of 100 people. (And men, you typically see even BETTER results at a FASTER rate.) We measure the area you would like treated before and after the first session so you can see the immediate impact. Maintaining a good diet and exercise program will help you keep these results. Will the Cryoskin 2.0 help with my cellulite? YES. The Cryoskin 2.0 can also help clear up cellulite. This works by cooling the subcutaneous areas of the legs, which creates vasodilation or expansion of the blood vessels. This brings in more collagen which helps break down the fibers which create the dimpling. Eating well and a good exercise regimen can possibly keep the cellulite from returning. Can I use the Cryoskin 2.0 on my face? It also has a facial treatment, which is more natural than Botox and can be as effective. These non-invasive and targeted treatments typically last for about a month. We will be launching the Cryoskin 2.0 in August 2018! If you aren’t already, make sure you are signed up for our newsletter. We will be offering INTRO pricing for our readers and the ability to PRE-BOOK appointments before anyone else. You can sign up for the newsletters by clicking here.